Ukrainian pilot speaks about her life behind bars. 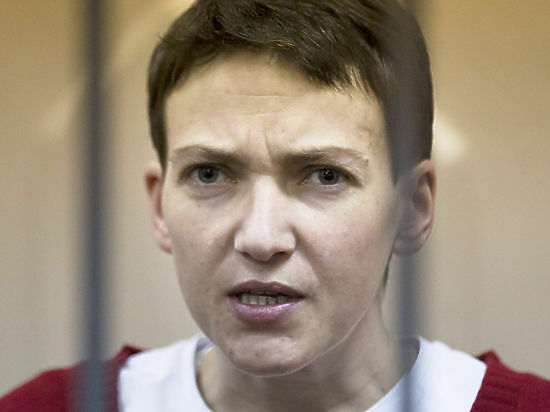 A few days ago, Ukrainian pilot Nadezhda [Nadiya in Ukrainian] Savchenko was rather unexpectedly sent for treatment to a civilian hospital, and then, equally suddenly, back to the SIZO [pre-trial detention facility]. The journey along the route Matrosskaya Tishina–Hospital N20–Matrosskaya Tishina took just over two days. That was obviously not enough time for treatment, but in that case, what was the fuss about in the first place? How is she feeling today? Ward cell N 726 in the special block of the legendary Matrosskaya Tishina. Savchenko is here alone, as usual. She sits on an iron bed, wearing a jacket (the cell is chilly). Her legs are purple – because of an allergy, which has only gotten worse. Nadiya Savchenko. Photograph by AP. “I am fine. I am totally fine,” Nadiya says. Then why were you transferred to a hospital? That was where you were taken, wasn’t it? “I have never been hospitalized before, but I visited family and friends in hospitals. So I know what they are like. Everything is white, large windows, and you can see trees outside–while I was put a cell, much worse than the one in the “Matrosska.” A tiny narrow window by the ceiling (you can’t even reach it, let alone look through it). A black door. Not even a bathroom. I am guessing that the people [whom] they usually put here can’t get up to use the bathroom anymore, and have a bedpan brought to them. No television, either, nothing. Just bare walls and ceilings, bars and guards. A coffin cell for bed-bound patients. This is a place where one comes to die, and I don’t intend to, not yet. But were you given any medical aid there? “I understand. But then, from the ICU, they took me to diagnostics, for some reason. I walked down the corridor in handcuffs, with a convoy – all the patients were horrified. The entire hospital was watching that scene. The analysis results were not too bad. They change depending on whether I ate or not, after all. Back at the SIZO, before being transferred to the hospital, I ate some baked cottage cheese. I also ate at the hospital (but threw it up). So my analysis results looked normal. “I spent 24 hours in the cell and asked to be taken back to the Matrosskaya Tishina. I wrote a statement saying I refuse treatment. A board of doctors got together and decided that my condition was not critical, and I can be returned to the SIZO. I’m glad they took me back. I don’t need treatment. When I am unconscious, dying, and unable to fight back – then they can treat me. But right now, I don’t want it. Especially in a place like that. You had complained that letters addressed to you were not reaching you. Did that problem get resolved? You are cold all the time, perhaps also because of malnutrition. Have you considered doing sports or yoga? I could bring you some books on yoga. Is it going well? Could you show me? Are you preparing for it? This entry was posted in #Free Savchenko, English, English News, Eyewitness stories, News, Pictures, War in Donbas and tagged #FreeKolchenko, #FreeSavchenko, #freesentsov, #Human_Rights, #Nadiya Savchenko, #RussiaInvadedUkraine, #SaveUkraine, #StopRussianAggression, #UkraineUnderAttack, Russia, Ukraine, war in Donbas. Bookmark the permalink. No she’s not! And no one serious about her plight should take comfort from those words. We have to act, our politicians have to act and threaten Putin and his mafia with harsh reprisals if he doesn’t release her. Fight for your hero Ukrainians because Nadiya represents your new country like no other man!